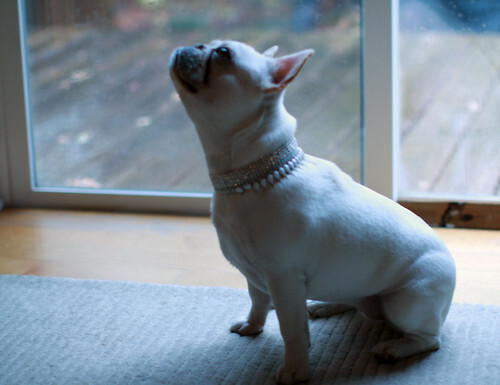 My sister-in-law requested a rhinestone collar for her beloved French Bulldog. She had seen one that Martha Stewart did for her dogs and thought it would be the perfect holiday bling for Myrtle (her dog). I checked out Martha’s tutorial and frankly thought the dangling rhinestones were a little tacky and was not willing to shell out close to $70 on rhinestones. So, I purchased a few vintage necklaces on ebay and found this great milkglass necklace to give it a little individuality. 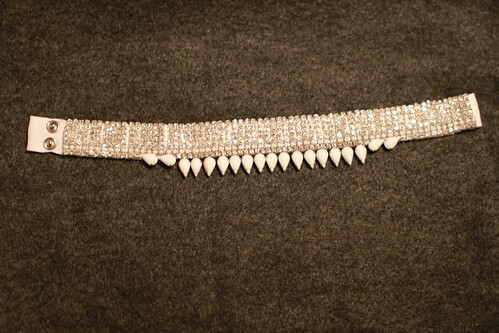 The collar is a 1″ pave of rhinestones with the milkglass necklace at the base on a grosgrain ribbon. It has regular pound on snaps to close and I backed it with a second piece of grosgrain to cover all of the stitching. Though our own dog tends to get plain old nylon or leather collars, I think Myrtle wears this well. Thanks for the inspiration Martha.